Black Ink Tattoo in Okinawa City has expanded its services, bringing a jewelry and accessories artist and a nails specialist into its BC Street store. The tattoo artistry of Mr Yoshi has been adorning bodies for years, and Black Ink Tattoo celebrated its first anniversary in April. 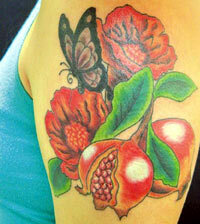 He has created hundreds of original designs for customers, and offers dozens of more standard tattoos, too. 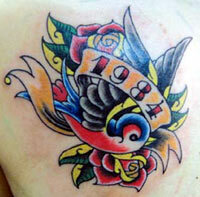 Tattoo works are available in black and gray, or color, including special tribal designs. For the discerning customer wanting something totally unique, Yoshi will create a special one-of-a kind design. Studio Lazy Flow’s name belies its products, largely in the jewelry and hemp accessories realm. Art and clay jewelry, silver jewelry, and dozens of hemp items are handcrafted. Prices start at ¥700 on necklaces and pendants, bracelets and rings, earrings and key holders. Worn Zippo lighters get a new life at Studio Lazy Flow, complete with custom designs. The studio also produces a variety of handmade tote bags and custom sewn room shoes and slippers. Vortex Nail, owned by an award-winning specialist, creates not only beautiful nails, but henna tattoos, as well. Miss Mieko Lee has captured first place in the Cosmoprof North America Nail Competition, first place in the Strut Your Stuff Beauty Technician competition, first place in the Chicago Midwest Beauty Show Nail Pro Competition, third place in the Nailimpics in Las Vegas competition, and more. Henna tattoos are her personal specialty, using all natural henna, lemon, sugar and essential oils. 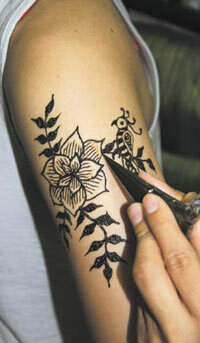 Although a manicurist, Lee can also design henna tattoos. Designs are created in minutes, at a cost of about $20. Small tattoos cost cheaper. She says henna tattoos can last about two weeks, depending on individual body conditions and where on the body the tattoo is placed. Vortex Nail is running a special campaign through October, offering free three nail seal designs with a manicure or pedicure.